Often referred to as "the lady in red" because of her brightly painted hull, the MV Ross Revenge (pictured) was home to many stations, the main one, of course, being Radio Caroline. 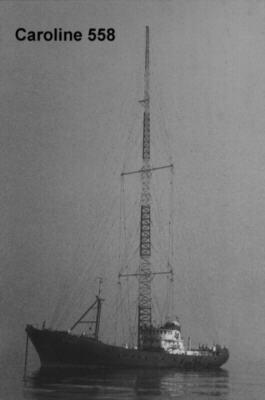 After the sinking of the MV MI Amigo in March 1980 and an absence of three and a half years, Caroline returned to the airwaves on 19/8/83 from this magnificent vessel, anchored 18 miles off the Essex coast, England, in the Knock Deep area of the North Sea. Reception was excellent all over England and the Continent, even reaching Scotland and Scandinavia. This made the ship an excellent base for other stations to operate from, targeting the Continent, even the world, and generating valuable revenue for Caroline which by now was not, in itself, a commercially successful operation, and was to become even less so over the following years. 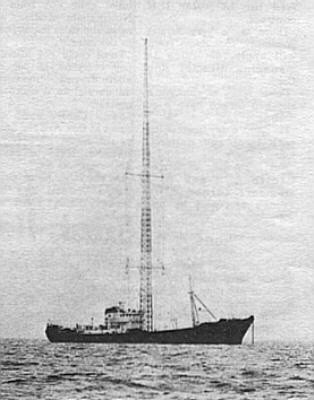 Radio Monique started broadcasting from the ship on 15/12/84 on 963 kHz with a Dutch language music station aimed at the Benelux countries. Religious programmes were also broadcast by Dutch evengelist Johan Maasbach. Caroline started a new frequency of 576 kHz and operated 24 hours. On Friday 13 November 1987 Monique announced that it was closing down for a change of frequency - not the best of days to make such an announcement as it turned out. After returning on 15 November on 819 kHz, the station was heard no more after the aerial mast snapped on 25 November 1987. This also put Caroline off the air. By this time the MV Ross Revenge had moved anchorage near to South Falls Head, 14 miles north-west of Margate. 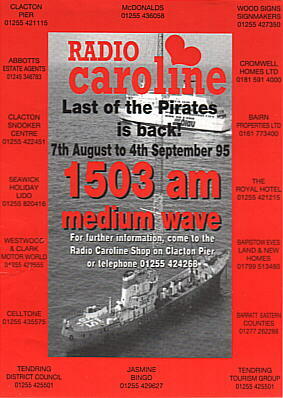 Radio 558, a Dutch language music station, started broadcasting from the ship on 9/5/87 during the day on 558 kHz, leaving Caroline to operate at night on 558. This station was started by some of the founder members of Radio Monique. World Mission Radio started broadcasting from the ship on 6/3/88. This was a quasi-religious based station with an output of gospel-rock, preaching and even a DX programme. This station used a Short-Wave transmitter on 6215 kHz in the 49 metre SW band and could be received all over the world. At times, Caroline relayed the 558 kHz output on 6215 kHz, and for the first time in her life Caroline was covering the world. On 30/5/88, Radio 819, a Dutch language music station, started broadcasting test transmissions from the ship with regular programming beginning on 9/7/88. Caroline's transmissions returned to 558 kHz. 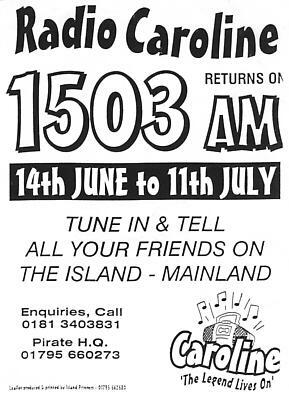 The following year, the most incredible event in the history of offshore radio occurred. On 19/8/89 the ship was boarded by the Dutch authorities, various pieces of studio and broadcasting equipment were removed and destroyed and the station effectively put off the air. An on-going commentary of events was given on air with requests for help until the station was forced off the air at 13:01. The Radio 819 programme was continuing simultaniously until it stopped abruptly and went off the air at the same time. Even more incredible than these events was that Caroline returned to the airwaves on 1/10/89. She continued to broadcast with great difficulty due to financial and logistical problems until November 1990 when finances ran out and she closed down. She stayed at sea for another year when more dramas occured when her anchor chain broke and she ran aground. The small crew on board were saved by helicopter and the ship towed into Dover. She stayed there for some time even broadcasting her output of "love, peace and good music" on Restricted Service Licences, and then moved to the River Blackwater in Essex to continue broadcasting regularly on RSLs, satellite link-ups and links with local radio stations. Later based at Queenborough, Isle of Sheppey, England, she continues to be lovingly maintained and renovated by the dedicated members of the Ross Revenge Support Group and Radio Caroline Club. The museum contains many recordings which include all of the above stations and events. MV Ross Revenge at anchor. Caroline regularly returns to the air with 4 week restricted service licence broadcasts.